Killed it on a buddy's farm Dec. 18th about 7:45 in the am. Had to find a hole through tons of twigs and made about a 20 to 21 yard shot that dropped him. Arrow went down through his spine and into the chest cavity. Used a 56# SA shooting a Carbon Express 4560, 125gn Nugent two blade head with a 100gn steel insert. Nice weight at 565gn and dead on 10gpp. 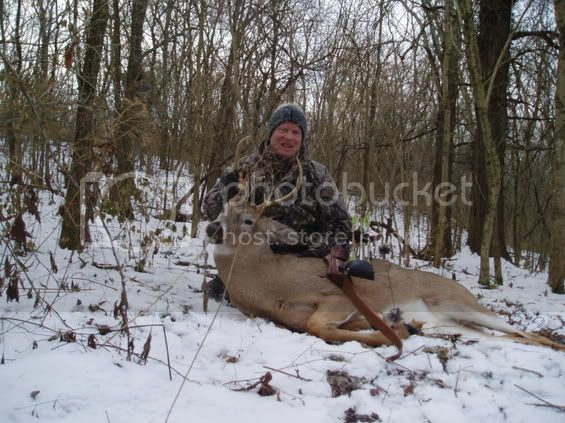 Way ta go Mike,nice buck,bow,whats that white stuff,wish we had some! !